Envío GRATIS en pedidos de más de $499. Escuchar Reproduciendo... Pausado Muestra de la versión audiolibro de Audible. Master the fundamentals, hone your business instincts, and save a fortune in tuition. The consensus is clear: MBA programs are a waste of time and money. Even the elite schools offer outdated assembly-line educations about profit-and-loss statements and PowerPoint presentations. After two years poring over sanitized case studies, students are shuffled off into middle management to find out how business really works. Josh Kaufman has made a business out of distilling the core principles of business and delivering them quickly and concisely to people at all stages of their careers. His blog has introduced hundreds of thousands of readers to the best business books and most powerful business concepts of all time. In The Personal MBA, he shares the essentials of sales, marketing, negotiation, strategy, and much more. True leaders aren't made by business schools-they make themselves, seeking out the knowledge, skills, and experiences they need to succeed. Read this book and in one week you will learn the principles it takes most people a lifetime to master. 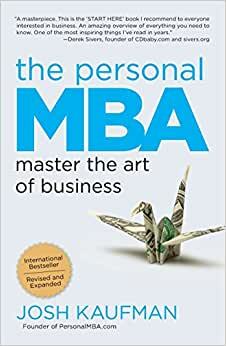 Comienza a leer The Personal MBA en tu Kindle en menos de un minuto. ¿No tienes un Kindle? Compra tu Kindle aquí o descarga una aplicación de lectura Kindle GRATUITA. "I've run across few people who conceptually 'grok' how to get things done better than Josh Kaufman." "File this book under NO EXCUSES. After you've read it, you won't be open to people telling you that you're not smart enough, not insightful enough, or not learned enough to do work that matters. Josh takes you on a worthwhile tour of the key ideas in business." "No matter what they tell you, an MBA is not essential. If you combine reading this book with actually trying stuff, you'll be far ahead in the business game." "A creative, breakthrough approach to business education. I have an MBA from a top business school, and this book helped me understand business in a whole new way." "An absolutely amazing book! I'm highly recommending this to all creative types, for the best overview of the modern business mind-set they need." "Josh has synthesized the most important topics in business into a book that truly lives up to its title. It's rare to find complicated concepts explained with such clarity. Highly recommended." "An enterprising and thrifty way to hack business school. This is a fantastic resource for motivated autodidacts looking to get into business." Good information to understand how the business is, without the need to go to business school. A confident resource to consult. This book has so much knowledge in it. If you are new to business, don't think about it, BUY THIS BOOK. The idea of skipping business education through reading this book is simply not enough, the author does go well beyond explaining some business terms, however there are some ideas I can disagree with, like the conformist stance of making "enough" is aiming for a mediocre audience that wants to fast track through life without putting actual work into it. One of the points in business education is the networking and connections you make through attending a business school. However I do like the way this book is set-up and arranged, once that you've read through the book you can search the concept list and refresh your memory for any concepts, it is a very good source of information if you want to accomplish more, since the longest three chapters of this book are meant to help you understand human emotions and self-development styles, if you combine this with some classes and real life work it can guide you in the right direction, but it won't get you to being CEO of a fortune 500 company, as the goal of a formal MBA education is. Overall I liked this book, I would recommend it for undergraduate students that want to know the basics of business, but I still wouldn't recommend anyone to drop out of school and pretend to be an MBA by reading this book.